Having heard a lot about AMP (Accelerated Mobile Pages), I have now taken my first steps. Before this, I understood the basic idea. Modern websites can take a while to load, especially on mobiles. As mobiles become the device of preference for browsing at least some of the web, Google want us to have faster, simpler sites. AMP implementation basically does that for you. Like magic, it creates a cut-down version of your amazing, elaborate, g-zip and cache enabled, but still rather slow-loading website with no fancy graphics, and just the most important text. Your business proposition, how to get in touch, a testimonial. that sort of thing. Like magic. I loaded the AMP plugin into my WordPress site. It says “…With the plugin active, all posts on your site will have dynamically generated AMP-compatible versions…” Nothing much happened! No Magic so far. 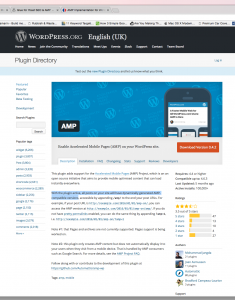 So I Googled a bit and discovered another plugin, AMP for WP. 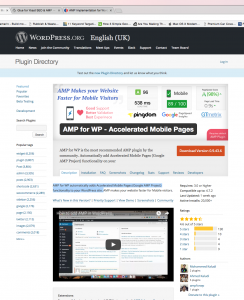 “…AMP for WP automatically adds Accelerated Mobile Pages (Google AMP Project) functionality to your WordPress site. …” Now, I’m not entirely sure which is the plugin that works and which one supports the other, but they seem to like each other. Anyway, this got me a little further forward. I now had an AMP page, as promised at www.mydomain/?amp. However, it only scraped the posts form my rather limited and neglected blog page. I could see some value , but not enough to rave about, and certainly not enough to pass on to clients. Added to which I’d picked up an almost instant error warning in Search Console (Webmaster Tools) which noted lots of red marks which I’d need to fix. Something was not as it should be. A bit more Googling led me to yet another plugin, Glue for Yoast SEO & AMP. 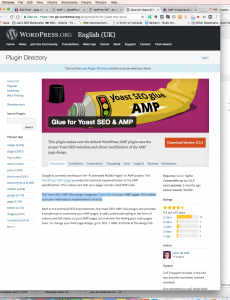 “…The Yoast SEO: AMP Glue plugin integrates Yoast SEO into your AMP pages. This makes sure your meta-data is implemented correctly.” Finally, I’d found the missing piece of the jigsaw. There were now some easy to follow prompts in my WP admin panel including one which says “Fix AMP Errors”. Just above that a new title had appeared: ‘Getting Started’. Now you tell me! In ‘Getting Started’ you can do everything you need to customise your AMP page, including uploading a tiny low sized logo to keep your brand intact in this minimalist offering, and another button which allows your home page content to feature instead of blog posts. Here is my AMP page: https://jokadesign.co.uk/?amp. Not pretty, but it does load pretty quick on mobile and contains my main message. More importantly, I believe Google gives me brownie points just for having it. And better still I can pass this benefit on to my clients now. I don’t think I’m a dummy, but sometimes I feel pretty helpless in the face of WordPress plugin wizardry that doesn’t quite do the ‘Ronson can’ thing. I hope my small contribution here might help someone with their AMP Implementation and feel less like a dummy than I did.